Well it has been a long two days. Yesterday I started at 5:00am in Phoenix packing the truck up. Then a long day at work trying to get everything arranged before I left, and then the six and a half hour drive to Las Vegas. The drive itself wasn't bad, but it was long. 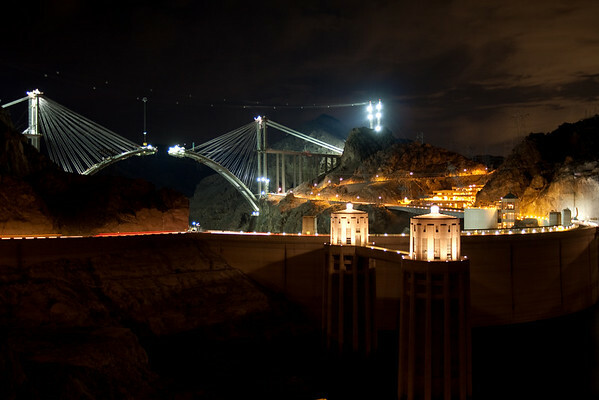 I did stop at Hoover Dam for a little bit to get a picture of the dam at night, what do you think? I got up early to head on toward Salt Lake City. It rained the entire way, OK sprinkled most of the way to Salt Lake. I had heavy rains for the last hour and a half, with people driving reeeeaaaalllly slow. This was probably not a bad thing as I did arrive on the seen of an accident about two hours from Salt Lake where some girls hydroplaned in their SUV and flipped it into the median. I stopped to see if I could provide additional first aid, but it was well under control and soon the Sheriff arrived. I believe everyone was OK, just a little shaken and a few cuts and bruises. Thankfully everyone was wearing their seatbelts. I arrive in Salt Lake and spent a wonderful evening with my brother and sister in law at their new house. Tomorrow afternoon, I will continue on toward Yellowstone. I hope to see you under these Western Skies.